The Pre-wired MNPV8 combiner is rated for outdoor use. Designed for combining high voltage strings using 10mm x 38mm fuses up to 200 amps total. The use of touch safe din rail mount fuse holders (MNTS) and fuses allow operation up to 600 Volts. The MNPV8 is rated for up to 200 amps. Fast, Convenient hook up with industry standard connectors. All aluminum powder coated housing that won't rust. Flip up cover that can stay in the open position during installation. 2 PV Negative bus bars with #6 and 1/0 connections. Chassis ground bus bar with #6 and 1/0 connections. Tin plated copper bus bar that connect PV Plus outputs that can be set up as 8 strings or 2 strings of 4. Included dead front cover MNPV12DF snaps into place after wiring is complete for safety. Connectors for PV in and PV out on bottom, additional knockouts on bottom and sides. Top surface is available to bring conduit in from directly above the enclosure. 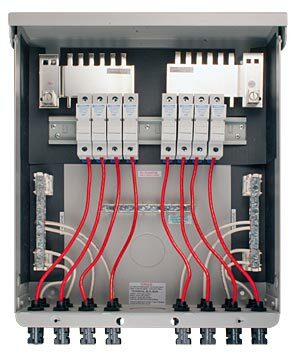 Description: This 3R pre-wired MNPV8 combiner is rated for outdoor use. Designed for combining high voltage strings using 10mm x 38mm fuses up to 200 amps total.